Exciting new images have been unveiled of Blackburn’s £30m Cathedral Quarter development – from the air. 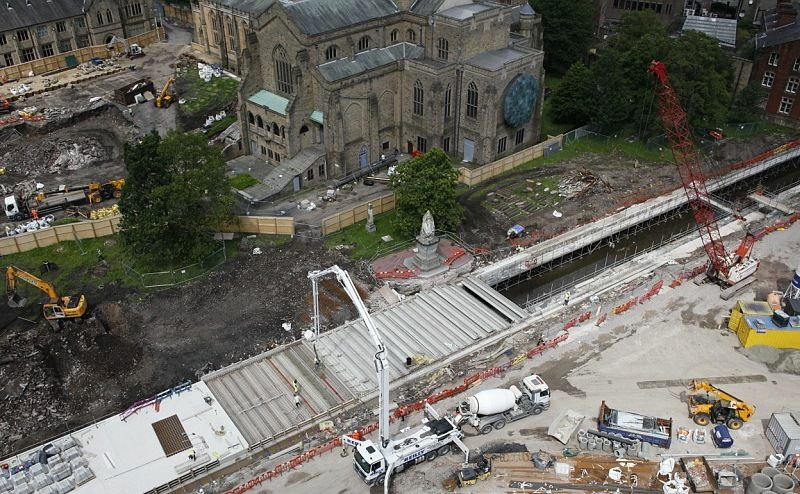 Contractors Eric Wright, who are working on the ambitious scheme which is a partnership between the Cathedral, Blackburn with Darwen Council, the Homes and Communities Agency (HCA) and the developer Maple Grove Developments Limited , have taken the images using an unmanned aircraft. The development includes a Premier Inn hotel, restaurants, shops, new bus interchange, a public square, landscaped gardens, and new offices. It also comprises Clergy Court, the Cathedral’s residential development, which will bring the Clergy and staff to live on site along with a refectory, library and office accommodation. This is the first new residential development within a Cathedral precinct since the 16th Century and will be of international importance in the Church of England. The project is part funded by the HCA. European Regional Development Fund and a loan awarded to Maple Grove by the Lancashire Enterprise Partnership from the Government’s Growing Places Fund. The images show the scale and width of the River Blakewater, which runs the length of the former Boulevard and is currently partly open. Significant progress has already been made on the new roof of the Culvert to allow the construction of the office and hotel on either side of the south end of the site. Piling for the office and hotel will start at the beginning of July.